As an official Salesforce partner, Cloud Industry has seen and experienced firsthand the truly impressive benefits of the Salesforce CRM platform. With a global reach of more than 150,000 customers and four million developers, Salesforce remains one of the world’s most respected names when it comes to cloud computing. Having been a part of the vibrant Salesforce Ecosystem for many years, Cloud Industry can attest to its ability to deliver both customer success and business transformation. In fact, an October 2017 report published by the International Data Corporation (IDC) estimates that by 2022, the Salesforce Economy will create more than 3.3 million new jobs across the globe. 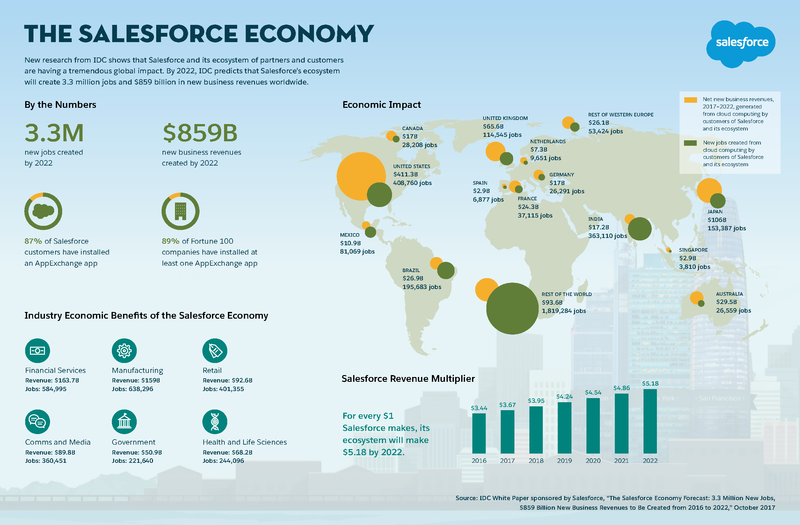 In addition, the Salesforce Economy will also create approximately $859 billion in new business revenues worldwide in the same time period – an astounding boon to the global economy! At Cloud Industry, our clients are pioneers in a wide array of industries including real estate, financial services, education, energy, manufacturing and the not-for-profit sector. With the support of Salesforce’s unique solutions, our clients are able to better serve their respective customers and in turn generate more business. It is estimated that for every $1 earned by Salesforce, the broader Salesforce Ecosystem will gain $5.20. This means that in the manufacturing sector alone, for example, there will be $159 billion in new revenue and around 638,296 new jobs created by 2022. For the financial services industry, revenue will increase by $163.7 billion and close to 585,000 new jobs will be created. Such statistics clearly demonstrate the profound impact that Salesforce solutions can have on Cloud Industry’s individual business, our clients, and other ancillary partners. As Salesforce continues to pave the way in new areas such as IT and analytics, the solutions they offer will only continue to improve. With sustained collaboration and mutual support, all stakeholders in the Salesforce Ecosystem will be able to play an essential role in making these financial predictions a reality. For more in-depth analysis on the benefits of the Salesforce Ecosystem, the full IDC report can be accessed here.